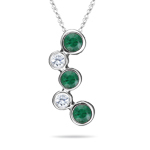 0.40 Cts Diamond & Natural Emerald Bubble Pendant in 18K White Gold . 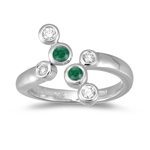 This awestruck Natural Emerald and Diamond Bubble Pendant showcases three appealing Emeralds, accentuated with two splendid Diamonds bezel set in 18K White Gold. Approximate Gemstone Weight: 0.30 Carats. Approximate Diamond Weight: 0.12 Carats. 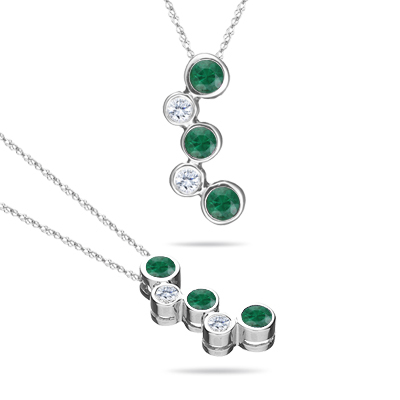 This charming pendant comes finished with an 18-inch 18K White Gold Singapore Chain.